Energy decentralization is a major development that could help tackle the energy challenges of the 21st century. Major technical and economic improvements have allowed substantial progress in decentralized energy resources, such as solar energy and storage and the Internet of Things (IoT), driving new cooperation and optimization capabilities. Also front and center are microgrids and microgrid benefits. Microgrid benefits encompass better resiliency, easier access to energy through a less capital-intensive, modular, scalable solution that is quicker to implement, more choice around when and how to interact with the grid and energy cost optimization. Microgrids are already a reality with numerous success stories of turnkey solutions. Energy reliability: Achieving resiliency through the microgrids ability to island itself from the main grid and be self-sufficient. Energy accessibility: Accessing energy at a reasonable cost when the main grid is not accessible. Energy independence: Reducing fossil fuel consumption by integration more renewable generation. Energy cost optimization: Utilizing energy flexibility to optimize energy mix and grid balancing. 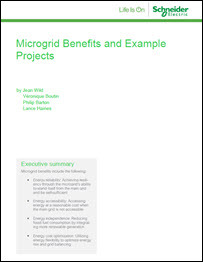 Download the white paper from Schneider Electric that explores the benefits microgrids can provide and supplies examples of relevant microgrid projects.